I am currently using IE9 and Vista Home Premium. I have two user accounts, my own and my wife's. In my account I can add, and organize favorites. In my wife's user account I cannot add favorites at all. When in her account I can use "control D" to bring up the box for adding favorites and it will even tell me that the favorite already exists and would I like to overwrite it. This was also a problem in IE8 so it's not new, but the wife is complaining that she can't save her favorites. soccio97--What method are you using? If this is not what you already do, you can right click on a blank spot on the webpage and then "Add to Favorites..." . Are you and the wife sharing a common Favorites folder? If so create a separate folder for each of you in your profiles. I tried everything suggested in the link and your post. Nothing works. We already have separate Favorites folders. Still nothing. Does this happen even if you try to add a new Favorite for a site you have never visited before? If so, post a screen capture of the error message you are getting. There is no error message. You can't tell that it didn't do anything until you look for it in the favorites list. If I try to save the same page twice or more it gives me a message that basically says 'That name is already in your favorites do you want to overwrite it". This only happens in my wife's user account not mine. There is no such folder. The only folder in C:\Users\Mom\Roaming is Microsoft. It's the same for my account and my favorites work. 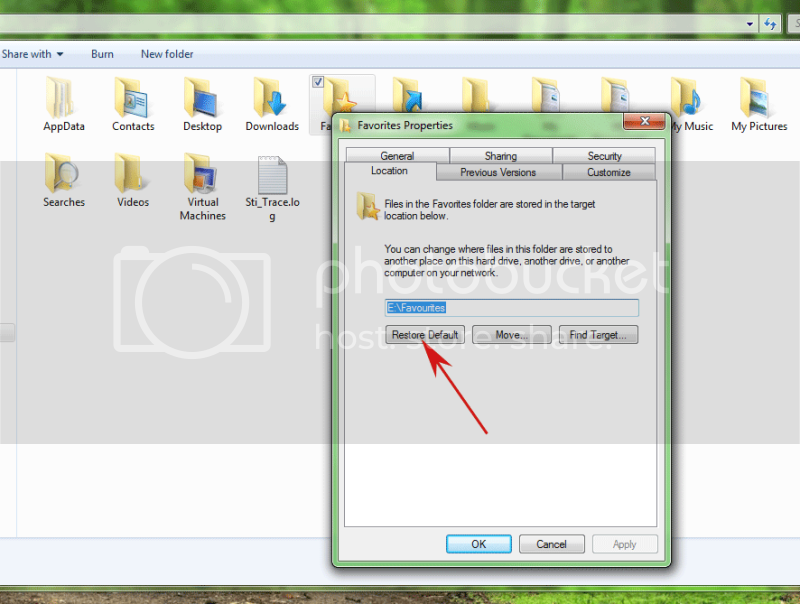 That would seem to indicate that the Favorites folders have been moved from their default locations. I clicked on the little star at the top right of IE9 and tried to add favorites and it acted like it was doing it but again nothing except the message stating that the site is already on the list and do I want to overwrite it. I clicked on the Favorites menu item and the same thing happens. I use "Control D" and I get the same results. In looking through the directory alll of the favorites I save seem to be under c:\Users\Mom\Contacts\Favorites\Favorites. When I follow the instructions in the link you provided I find that there is no "Location" tab with the "Mom" account. There is one for my account but I'm not having a problem with that. The registry key indicates that the Favorites folder is located at c:\Users\Mom\Contacts\Favorites\Favorites but I still see nothing get nothing under the Favorites tab in IE9. soccio97--What is in c:\Users\Mom\Contacts\Favorites\Favorites? Your statement "In looking through the directory alll of the favorites I save seem to be under c:\Users\Mom\Contacts\Favorites\Favorites." is confusing. I thought you could not save Favorites. ??? c:\Users\Mom\Contacts\Favorites\Favorites is not the Default Favorites account. The Default location is normally c:\Users\Mom\Favorites. Do you have such a folder? What is in it? Maybe you will find all those Favorites you have been trying to create. There is no "Location" tab under properties for that user account. The onlyUSer account that has a "Location" tab is the main usewr account and there is no problem with that one. Let me clarify; when I say I can't save to favorites, I mean I cannot recall what I save from the IE9 menu bar under Favorites. If I click on the Favorites tab in IE9 it is empty. If I navigate through the "C" drive folders I can see that there is a list of favorites, but I can't access them from IE9. Yes there is a C:\USers\Mom\Favorites and it has all the favorites in it but for some reason IE9 isn't using it. Is there a Location tab for the c:\Users\Mom\Contacts\Favorites folder? Make sure you are logged in to the Mom user account when checking. soccio97--Navigate to the C:\Users\Mom\Favorites folder. Right click on the folder, then click Properties. Can you access the Location tab? If so click the Restore Default button. Now can you see Favorites in the normal left panel Explorer bar (IE View| Explorer|Favorites)? If so, you should be able to normally create additional Favorites in the future. And, to save you the trouble of recreating Favorites in the c:\Users\Mom\Contacts\Favorites\Favorites folder you can drag and drop the files from there into the C:\Users\Mom\Favorites folder . Yes there was a "Location" tab there and I restored default location and everything is working fine. Thanks for all the help. Once again Viurtual Dr came throughwhen nobody else (Microsoft & HP) could help.